CSUN received a $165,756 grant from the Eisner Foundation to take a serious look at the programs offered by one of the county’s largest providers of services to grandparents and other family caregivers, the nonprofit Grandparent as Parents (GAP). Are the needs of grandparents and other relatives who care for children truly being met in Los Angeles County? 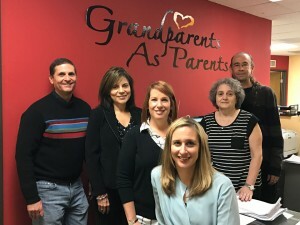 Researchers at California State University, Northridge have received a $165,756 grant from the Eisner Foundation to answer that question and others, as they take a serious look at the programs offered by one of the county’s largest providers of services to grandparents and other family caregivers, the nonprofit Grandparent as Parents (GAP). Once completed, the researchers will use their study as a catalyst for a conference on understanding the needs of this underserved and growing population. Taking part in the project, from left to right, are theater professor Doug Kaback, director of Neighborhood Partners in Action; Carmen Garcia Hoffman, executive director of GAP; Julie Gould of the Department of Social Work; Leigh Stenberg, director of development for the Eisner College, Sylvie de Todelo, founder of GAP, and sociology professor David Boyns, director of the Institute for Community Health and Wellbeing. Photo courtesy of Leigh Stenberg. GAP founder Sylvie de Toledo and Executive Director Carmen Garcia Hoffman said they wouldn’t have it any other way. Gould and a team of faculty and student researchers from CSUN’s Michael D. Eisner College of Education, Mike Curb College of Arts, Media, and Communication, College of Social and Behavioral Sciences, Institute of Community Health and Wellbeing, and the institute’s Neighborhood Partners in Action program will meet this spring with GAP staff and its clients to assess GAP’s services and programs. Once the assessment is done, university representatives will host a retreat for GAP’s leadership and help them develop a strategic plan for going forward, said CSUN sociology professor David Boyns, director of the Institute for Community Health and Wellbeing. In their application to the Eisner Foundation, university officials pointed out that in the San Fernando and Santa Clarita Valleys alone, 24.6 percent of all children are being cared for by grandparents. Nationwide, the number of grandparent-headed households has doubled since the 1970s from 3 percent to 6 percent — and approximately one in three grandparent-headed households have no parents present. Founded in 1987, GAP provides direct and indirect services to grandparents and other relative caregivers throughout Los Angeles County and in Ventura County. GAP annually serves approximately 1,400 family caregivers — of which 55 percent are caregivers over the age of 62 —and 2,100 at-risk children ranging in age from infants to teenagers. The Eisner Foundation was started in 1996 by Michael D. Eisner, then-chairman and CEO of The Walt Disney Company, and his wife Jane in order to focus their family’s philanthropic activities. The Eisner Foundation gives an estimated $7 million per year to nonprofit organizations based in Los Angeles County. In 2015, The Eisner Foundation became the only U.S. funder investing exclusively in intergenerational solutions.